At long last, we have eyes on the production version of the Lexus UX compact crossover that will debut at the Geneva Motor Show next month. The retail-ready model was previewed by the UX concept shown at the 2016 Paris Motor Show, which looked like Batman's loaner vehicle while his Tumbler was in the shop. 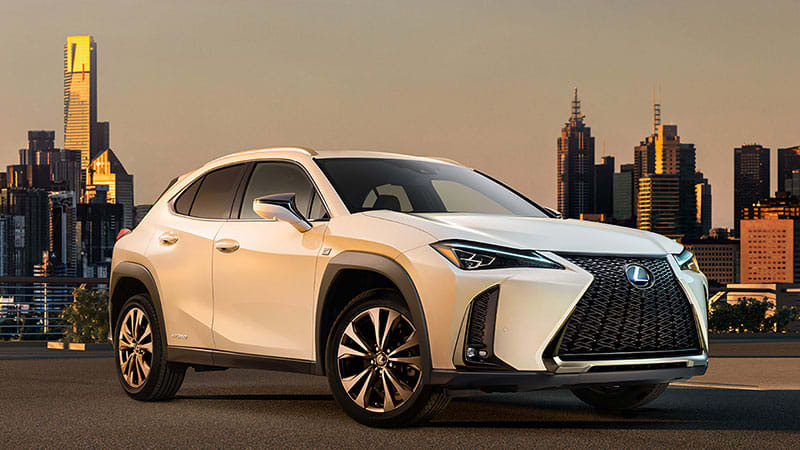 As one would expect, the UX that customers will be able to buy has filtered out all of the bizarro, leaving what looks like a little Lexus NX sprinkled with unique design cues, such as the upright vents in front and the full-width taillight. Lexus calls the UX its "first urban crossover," for reasons we can't imagine; even the Lexus LX, which could probably drive from Boston to Reykjavik if given a long-enough snorkel, only gets dirty in Jackson Hole or at Whole Foods. More reasonably, Lexus promises "exceptional body rigidity," a low center of gravity thanks to a hunkered-down platform borrowed from the Toyota C-HR, and handling that "will be as agile as a hatchback." Engine specifics will likely wait until Geneva, but we do know that Lexus trademarked UX 200, UX 250, and UX 250h a couple of years ago. The big-brother NX comes in 300, 300 F Sport, and 350h guises, but is equipped with a 2.0-liter turbo putting out 235 hp in standard spec. Lexus will need room between the UX and NX, but UX competitors like the Audi A3 pump out 200 hp, and the BMW X1 serves up 228 hp. The teaser video above reveals the instrument panel, topped by a widescreen infotainment center that looks like a minimalist rework of the Lexus RX interior. The gauge cluster has physical dividers but appears to be completely digital. You can watch Lexus' livestream from Geneva for all the details we don't have now, or just check back here on March 6 for the particulars and the photos. Looks more like a hatchback than a "crossover." Not too fond of those '18 Toyota grilles which remind of the open mouth of a blue whale. Think I'll keep my ''11 V6 RAV with 269 HP and most likely larger cargo capacity. Perfectly understand your view, I had a 2006 V6 but this is the size of a C-HR. (Sub)compact crossover smaller than the RAV4 and NX series, likely outright replacing the CT200h. I'm hit or miss on the Lexus "spindle" grille designs too.